I like how you used the negative space from the punch. Your little patriotic girl is adorable!! 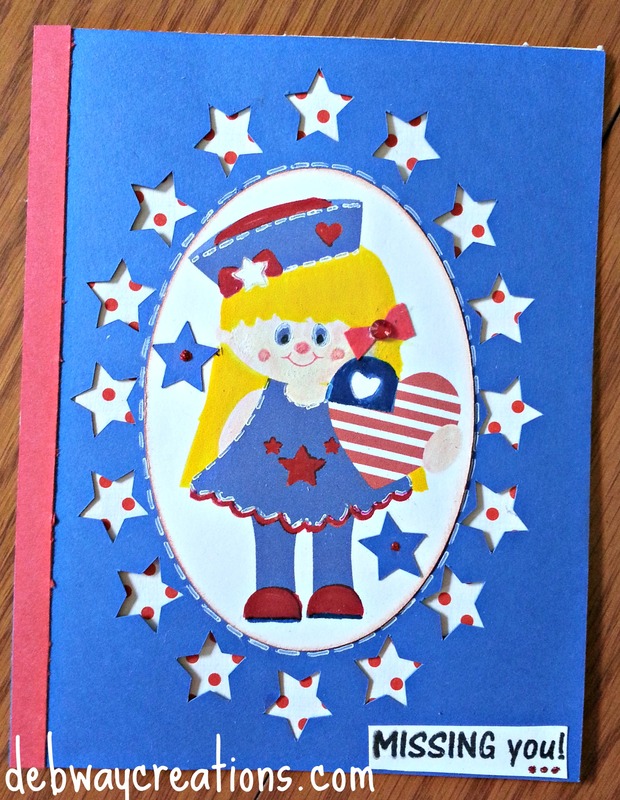 What a super sweet card, I love the little girl and the stars with the patterned paper peeking out. How adorable is this little patriotic girl?! So sweet! Sweet card with some beautiful detail! Have a great day and thanks for supporting OWH! Wow. Awesome job with piecing this gal together. She is adorable, and makes me want to buy a Cameo! She looks so sweet! I like the polka dot stars. very cute little girl and I like the frame of stars. Cute, and I like the use of the negative! Adorable! I love the cutout stars you’ve framed her in. Thanks for joining in the hop and supporting OWH! This is so cute! Have not used my Cameo to make cards like this yet, see that changing very soon. So cute and clever a design with this little girl. I love how you cut out the stars on your card – looks really cute. Like how the stars frame the oval! You got your money’s worth with this card from the Silhouette. Precious! Love the smile on her face and the patriotic heart. What a cute little patriotic girl in her star frame. Great job with the paper piecing! Isn’t using the silhouette so much fun for making cards! I’m addicted to mine. You did a great job with it. What a cute little patriotic girl! Love how those red dots peek through the stars. So adorable. Don’t you just love the Silhouette? This is so cute, I love that little girl and the bright colors! An adorable patriotic cutie! Love it! Very sweet! I love how the cut out stars circle the little girl. Thanks for supporting OWH! That’s such a cute little girl stamp! It’s the perfect accent for the intended recipient to turn the heart into an American-flag theme instead of simply coloring it red. LOL…oops…I commented, then read the description….I guess the little girl is not a stamp, but, a paper piecing pattern? Did you find it online? Hi, Yes it is an image from the silhouette online store. The little girl is gorgeous! Really great job on the card. Terrific job on your card – love that cute little image! This is cute. I love the star border. Sweet card! Perfect for a little girl! The base paper adds a little movement when peaaking out through the stars! TFS!!! So cute!! I know that took a lot of time to put together. So many “missing you” cards are definitely for adults. I like it that this one could be used for a girl child. Cute card. I like the stars on the oval, they add a lot to your card. Great. Issuing you card for a child! Such a cute little girl! I’m digitally challenged so hat’s off to you for a great job! Thanks for participating in the bloghop. What a sweet card. Great layout and paper piecing. She’s so CUTE!!!! The oval frame with the border of stars really adds to the patriotic look. I’m going to agree with everyone…..this is such a cute, cute, card! Sweet card! I like the color behind the star openings too. Thanks for sharing! Great job of assembling the girl. I love the cut out stars with more stars underneath them. Thanks for supporting OWH! Cute card. Thanks for being a hop stop. Cute little girl card! I really like the sentiment; I haven’t heard of CardzTv before. Have to check them out! Cute girl and love the paper piecing you did! Such a cutie , that Cameo must be fun to play with!